Nashville venue Exit/In has unveiled a commemorative mural by local street artist Bryan Deese to commemorate its 45th anniversary. Each stencil was carefully chosen for their contribution to the history of the venue and the stencils were made from photographs of the actual performances at Exit/In, many of them shot by notable rock photographer Alan Mayor. 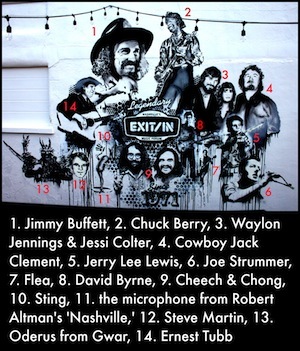 The mural, which is located on the left, outer wall of Exit/In and is best viewed from the patio at Hurry Back, includes detailed stencils of artist, comedians and more who have graced the stage of Exit/In over the years and made it one of the most legendary venues in Nashville. 1. Jimmy Buffett was the first artist to play Exit/In in 1971. 2. Chuck Berry has performed at Exit/In several times, most notably in 1980 at the grand reopening. Prior to that time, the stage had been on the Elliston Place side of the venue and the entrance in the back, hence the name, Exit/In. 3. 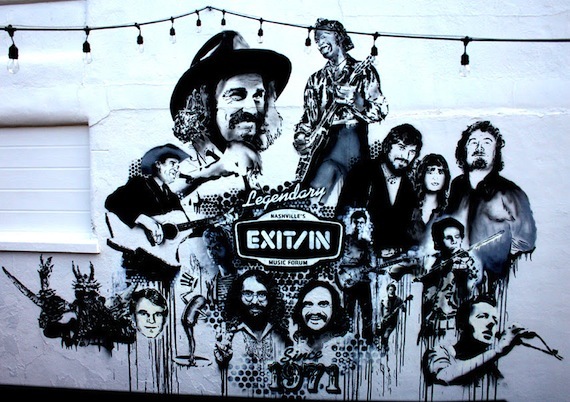 Waylon Jennings and Jessi Colter were some of the few country artists to perform at Exit/In in 1975. Many years later, their son, Shooter Jennings performed on the very same stage. 4. Cowboy Jack Clement performed several times at Exit/In throughout his career including the 40th anniversary celebration. 5. Rock and roll wildman genius Jerry Lee Lewis performed at Exit/In in 1974. 6. Joe Strummer performed at Exit/In with his band The Clash. 7. Flea performed on Thanksgiving night at Exit/In with the Red Hot Chili Peppers in 1987. Before their set, they had a formal holiday dinner on the bar. 9. Aspiring comics Cheech & Chong cut their teeth at Exit/In in 1973. 10. On the cover of The Police’s Zenyatta Mondatta album, Sting can be seen in one of the small photos wearing an Exit/In t-shirt. 11. The iconic microphone from the poster of Robert Altman‘s 1975 film, Nashville. One of the most memorable scenes was shot in Exit/In. 12. Each of Steve Martin‘s three Exit/In appearances ended up outside the club. The first time, he took the audience across the street to see his new red Trans Am in a church parking lot. The second time, he tied skinny balloons around everyone’s heads, lined them up in the middle of Elliston Place, and led a Bunny Hop procession in the direction of Baptist Hospital. The third time was so funny that he has recalled it to several interviewers over the years. At the end of his late show, he took the arrow out of his head, laid down his banjo and said, “Man, I’m starvin’. What’s the name of that eat-a-sackful place up the street?” The audience howled—at that time, there was a Krystal up on West End across from Vandy. And off they went. 14. Ernest Tubb celebrated his 65th birthday in 1979 at Exit/In with a guitar-shaped cake and celebrity guests including Mae Axton and Peter Fonda.